Ignoring Racist Tweets, 11-Year-Old Nails National Anthem ... Again : The Two-Way After having racist tweets hurled in his direction, Sebastien de la Cruz was invited to sing again at the beginning of the Heat-Spurs game in San Antonio. 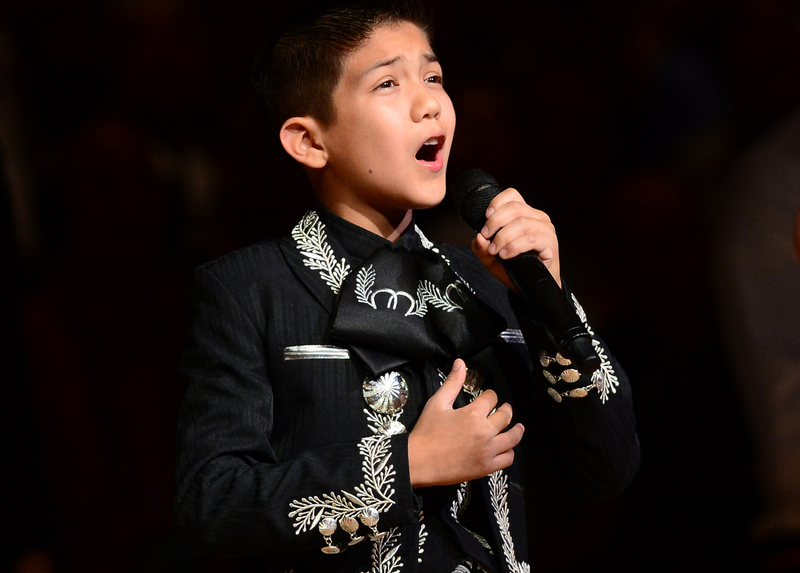 Sebastien de la Cruz, known as San Antonio's Little Mariachi, sings the national anthem before the start of Game 4 of the NBA finals on Thursday. Something pretty magical happened at last night's NBA finals: Sebastien de la Cruz, the 11-year-old who sang the national anthem on Tuesday, was back on Thursday to prove his critics wrong. With a maturity that belies his young age, de la Cruz told KENS-TV that he was ignoring those tweets. "My father and my mama told me you should never judge people by how they look," he said. The Spurs responded by inviting him back for Game 4 last night. He was introduced by San Antonio Mayor Julián Castro, and President Obama also previewed his performance via Twitter.